If you do anything with DNN, this year’s DNN Summit event is going to be the place to reconnect with the community in North America. This isn’t just “another DNN event.” The organizers and sponsors are looking at it as a new opportunity to revitalize the DNN community, to drive the next chapter of DNN growth, to discover and learn together. We’re taking a queue from our favorite cue-balled DNN community member, Clint Patterson, a longtime DNN evangelist, former DNN Corp rep, Bojangles’ aficionado, and now platform manager at Arrow Consulting and Design. Early in his opening keynote for DNNCon 2016, Patterson told the gathered crowd, “We want to make DNN great again.” While he was making a bit of a pun, the goal is very real for Patterson and the DNN Community. It’s a great call to action, and one we want to be a part of. We want to give back to the DNN community. We want to promote DNN Summit as best we can. We are a part of this community, too, and we want to give back in a measurable way. That’s why we’ve worked with the DNN Summit Committee to put together an enticing addition to sponsoring the event. 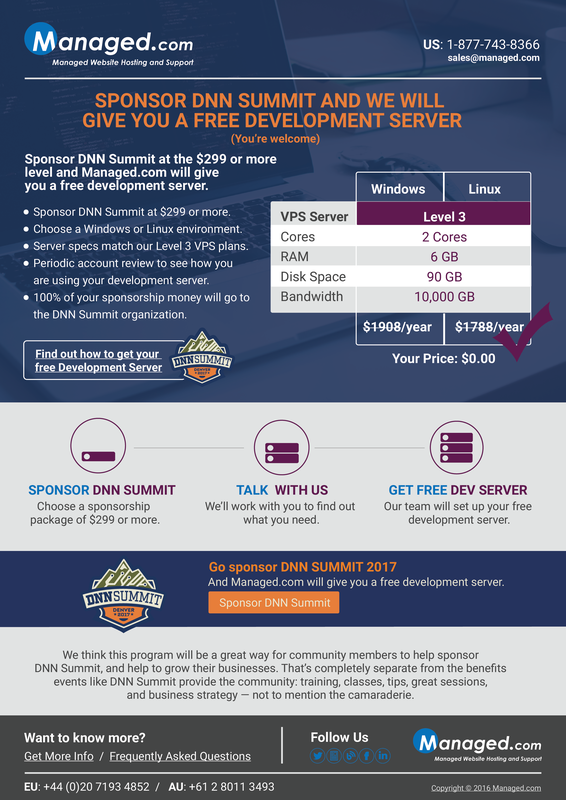 If you sponsor DNN Summit at the $299 or more level, we will provide you with a free development server. It’s our way of giving back to the DNN Community. We’ve tried to keep the program as simple as possible, and we went through it in detail in our article announcing the program: Sponsor DNN Summit and we will give you a free development server — you’re welcome. If you would like more information about the program, that article is a good place to start. If you’d like to jump right into giving back to the DNN Community and sponsoring DNN Summit, well, first of all, thank you! And second, head right over to the DNN Summit sponsorship page to get involved. Want us to quit rambling so you can get started with sponsoring DNN Summit and get your free development server spun up? Fair enough. Just go to the DNN Summit sponsorship page and choose to sponsor the event at any level, with a minimum sponsorship package of $299 — the “Supporting Sponsor” level. Fill out the sponsorship details in the form below on that page, and when you get to the “Additional Details” section, let them know that you would like to take part in the Free Development Server Program from Managed.com. I’m excited to sponsor DNN Summit, and I would also like to take advantage of the Free Development Server Program from Managed.com. The DNN Summit organizers will pass your information on to us, and one of our Senior Technology Consultants will contact you in the next couple of business days to get your free development server lined up. Keep connected to all things DNN and DNN Summit related by following @DNNSummit and @ManagedDotCom on twitter, or use the hashtag #DNNSummit to join the conversation.